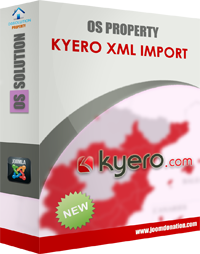 Kyero Import component allows administrator to import properties in XML feed from Kyero.com to OS Property database. Kyero Import component allows administrator to import properties in XML feed from Kyero.com to OS Property component. Kyero Import works on Joomla 2.5.x and Joomla 3.x if you are starting a new project utilising OS Property and Kyero import, we recommend you install on Joomla 3.x. You need to ensure that safe mode is off. The maximum size of an uploaded file. When an integer is used, the value is measured in bytes. This value must be higher than the size of Kyero XML file. This sets the maximum time in seconds a script is allowed to run before it is terminated by the parser. This helps prevent poorly written scripts from tying up the server. The default setting is 30. This value must be enough big to run the XML importing function. This sets the maximum amount of memory in bytes that a script is allowed to allocate. This helps prevent poorly written scripts for eating up all available memory on a server. Note that to have no memory limit, set this directive to -1. This value must be enough big to run the XML importing function.